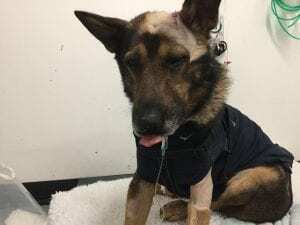 Brave police dog Finn was stabbed in the head and chest in the line of duty. Vital organs had been damaged, his injuries were life threatening and he was rushed to Davies for emergency open chest surgery. 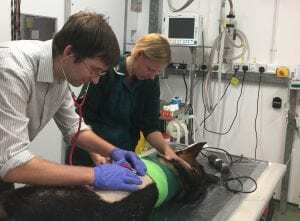 The wound under Finn’s left axilla was opened and explored; it tracked caudally through the superficial pectoral muscle and entered the thorax between ribs 8 and 9. 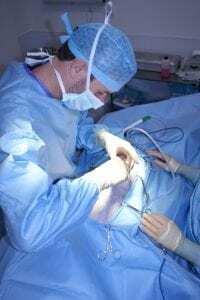 A lateral thoracotomy was performed for further exploration identifying a through and through penetration of the peripheral edge of the caudal part of the right cranial lung lobe and a further puncture into the right caudal lung lobe behind it. A thoracic stapler achieved partial lung lobectomies, the remainder of the thorax was unaffected which was flushed and closed. Overlying muscles were reconstructed and closed over multiple suction drains. The stab wound near Finn’s left ear was only skin deep so it was debrided, flushed and closed. Finn was then placed in intensive care for recovery. Finn recovered well. His chest drain was removed after 24 hours with no evidence of significant fluid or air in the chest and was back on his feet the day after surgery. He was discharged from hospital and reunited with his family just three days later. Eight weeks on he was ready to return to work and on his first shift back he successfully tracked a suspect, which led to an arrest. Several months later he represented his constabulary in the Regional Police Dog Trials and won ‘best tracking’, ‘best building search’ and best overall search’ categories. 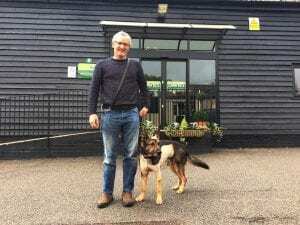 Finn has now retired from police duties and is enjoying life as a much-loved member of his handler PC Wardell’s family.